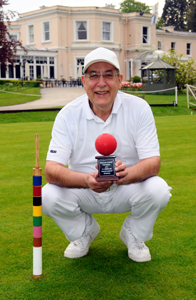 After weeks of 'winter play', Phyllis Court Croquet Club starts its regular season this Sunday. Members are reminded that 'whites' should be worn on court from then on. 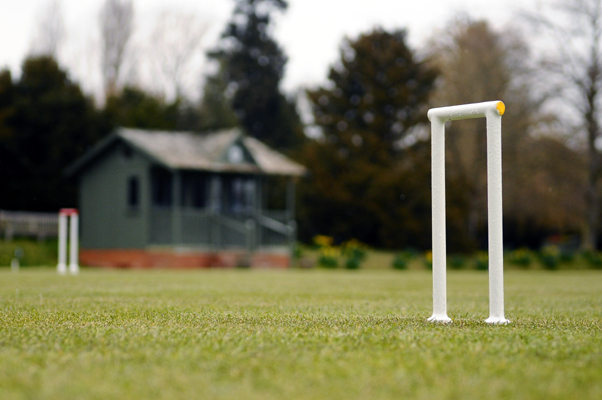 There is not long left to get your season-long golf croquet competition entries submitted. Response has been good but entry forms from a number of established players are still awaited. There has been enthusiasm for a new handicap competition and players of all standards are encouraged to support this event especially. Interest in croquet blossoms as the sun comes out and this season has been no exception and the Club welcomes 16 newcomers to our sport next week when four days of 'beginners training' starts on Monday. There are a number of members who have joined the club in recent weeks and have missed out on bookings for the first raft of training. 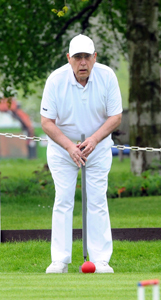 The Croquet committee will look to satisfy those late comers in the weeks ahead. The Club only has two active qualified coaches who can run classes all day, and could do with more to cope with the demand of Club members. Please approach a committee member if you would like details of coaches training courses that are available - your help will be much appreciated. The sign-up posters for you to enter our fist two tournaments of the year are now on display in the pavilion. These are the Charity One-Ball and the GC 5+ Doubles (aka. the Cave & Wolfe). See the calendar for all out tournament dates - to be fair to everyone, the sign-up posters go on display four weeks before the event. 6th April - The new hoops are in and our 'regular season' starts - in the rain! Despite a chilly day and some persistent rain a good few hardy souls welcomed in our regular season in their waterproofs. We have purchased two new sets of cast iron hoops and so now all four of our laws boast these good furniture improvements. Ten keen Ac players pitched-up for the first AC all-comers session today and it was positively balmy by mid-morning. Sonia Cox marshaled everyone in to enjoyable 14 point games before a half time 'change around' of personnel. It was so lovely that everyone forwent the coffee break. At the half-way point in their training, it is good to be able to report that the 16 beginners undergoing initial training this week are all showing signs of improvement. Coaches Frances Colman, Vivian Thomson and Chris Roberts have been approached by a couple of chaps and one lady who have an interest in trying AC too, which is most encouraging. On Monday 14 April (afternoon), the GC sub-committee coaches will be offering training to all those who have entered our new 'Handicap Singles' competition. So that we can avoid everyone turning up at once, please book you hour session by contacting Chris Roberts on 079 7378 7710. The decision to run an afternoon 'crash course' in handicap play and how best to use 'extra-turns' was fully justified this afternoon. Over half the field of entrants for our new GC Handicap Competition attended for tips on how to beat our low handicapped players by good planning. Afterwards a good number stayed on the watch the court-side open draw for the competition's first and second rounds. The full 44 player draw will be published shortly, but the 'match of the round' will undoubtedly be the pairing of Mary Gaynor and Raymond Wood. 11th April - 16 beginners trained, only another 8 to go! At the end of a long but enjoyable week of training, 16 beginners now have a good appreciation of croquet. After eight hours, over half had reached the standard required to attend GC 'all-comers' sessions to mix in with existing members. A further eight beginners will be trained later this week and conclude next week, when Raymond Wood will join the coaching team. Pictured are seven of those who were given 'their wings' today. 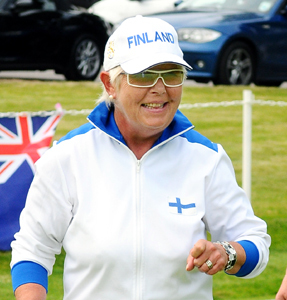 Helena Fensome and Chris Roberts played in their first top-flight GC event of the season at Surbiton this weekend. The event was won by UK no.2 Will Gee, who defeated Sweden's Jonatan Andersson in the final that was a master-class of long range clearances. No ball within three quarters of the court was safe, such was these young lads' accuracy - it was quite breathtaking stuff! In the 'head to head' game between the two Phyllis Court players, Helena's long distance hoop running showed that she has rediscovered her old form and she won the game comfortably. PCC 'A' will play Cheltenham on Saturday 10th May (away) in the National Inter-Club Championship first round. Chris Roberts (0), Charlie von Schmieder (1), Mike and Helena Fensome (both 2). The playing orders for our GC season-log competitions were published this evening on this website and also be on display in the pavilion shortly. 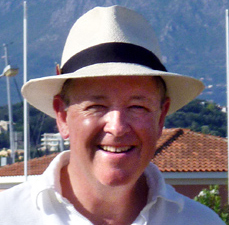 See them via the orange buttons on the front page or Golf Croquet page. The main Club's newly-acquired statue Arabesque en L'air was formally unveiled aadjacent to croquet court 1 at lunch time today. It is the work of sculptor and PCC member John Penrose. Roger Goldring was quick out of his blocks to organise and play his first round competition tie and become our first winner this season. he beat Pat Lane in the first round of the 7+ singles competition and will now face John Kennedy in the round of 32. Well done to roger and Pat for acting so swiftly. Diane Brown and Delia Norris were new faces at team practice today and, along with ten others, they enjoyed learning the tactical 'nouse' of handicap play that will see them in good stead for the season ahead. Rain waterlogged courts forced the calling-off of our first tournamant of the season - the Charity One Ball. If ever one needed proof that practice makes perfect - step forward Roger Goldring, who's hours of solo court time since the floods receded, have certainly paid dividends. Although seeded as an outsider for the 5+ Singles Tournament today, he quickly drew attention to himself with three fine wins on the way to topping his block by lunch time. He then disposed of Colin Morgan in the quarter-finals and one might have expected his bubble to burst when he faced the vastly experienced John Chalfont for a place in the final. But not so, and some excellent straight hitting away, growing tactical nouse and by now greater confidence, took him to a last hoop victory despite peeling Chalfont through 12 which looked disastrous. Last year's winner Alex Earnshaw had quietly progressed to final again thanks to five straight victories including seeing off Ralph Chambers' challenge in the semis. But there was just no holding Goldring in that final. He built a big lead very quickly, and although a 'wobble' near the end allowed Earnshaw a sniff of a come back, Goldring ran out a deserved winner 7 - 4. This is Goldring's first tournament win (so soon after only taking up the game last year) and hearty congratulations to him indeed! A confident PCC 'A' squandered a 2-1 half-time lead at Winchester today to lose our first league game of the season. Ian Norris and Chirs Roberts got our team off to a good start by winning the doubles rubber in two straight games and then Helena Fensome scored the narrowest of victories in her morning singles match at 13th hoop of the third and deciding game. Mike Fensome lost the other singles match and our team fell away in the afternoon to lose all four matches and the fixture 2 - 5. Norris and (Mike) Fensome equipped themselves well despite a relative lack of experience at this level - the former's wonderful ball placement and the latter's clearances drew complimentary remarks from our hosts.